I am a historian of late medieval and early modern English queenship. I am the author of a biography of Queen Katherine Howard and a study of late medieval English queenship. Mystery surrounds Anne Boleyn's appearance. Contemporaries were ambiguous in their descriptions of the appearance of Henry VIII's second queen: either she was a slim and very beautiful, small-breasted Venus, or a grotesque, deformed creature who had lured Henry VIII into breaking from the Roman Catholic Church and marrying her. Controversy centres, in particular, on the colour of Anne Boleyn's hair. It is worth noting that no surviving portraits of Anne Boleyn date from her own lifetime. At the very earliest, they were painted in the reign of her daughter, Elizabeth I, and may have been based on lost originals; thus dating, at the earliest, fifty to sixty years after her execution in 1536. The standard portrait of Anne Boleyn, a copy of which is now housed in the National Portrait Gallery in London, depicts the queen wearing a French hood, black gown and pearls with a 'B' choker. In most of these portraits, Anne is portrayed with very dark brown or black hair. Anne Boleyn was rather tall of stature, with black hair and an oval face of sallow complexion, as if troubled with jaundice. She had a projecting tooth under the upper lip, and on her right hand, six fingers. There was a large wen under her chin, and therefore to hide its ugliness, she wore a high dress covering her throat. In this she was followed by the ladies of the court, who also wore high dresses, having before been in the habit of leaving their necks and upper portion of their persons uncovered. She was handsome to look at, with a pretty mouth. Sander presented the queen as a witchlike figure who had cunningly seduced Henry VIII into abandoning his virtuous wife, Katherine of Aragon, and breaking with the true Church to marry her. Leaving aside the suggestion that Anne favoured high dresses - for which there is no other extant evidence - Sanders' description of Anne corresponds strikingly with the representation of the queen in the NPG pattern of portraits, two of which are provided at the top of the page. We can observe the queen's 'black hair', her 'oval face of sallow complexion' and 'pretty mouth'. His description of her raven hair, in particular, corresponded closely to contemporary notions of a witch's appearance. 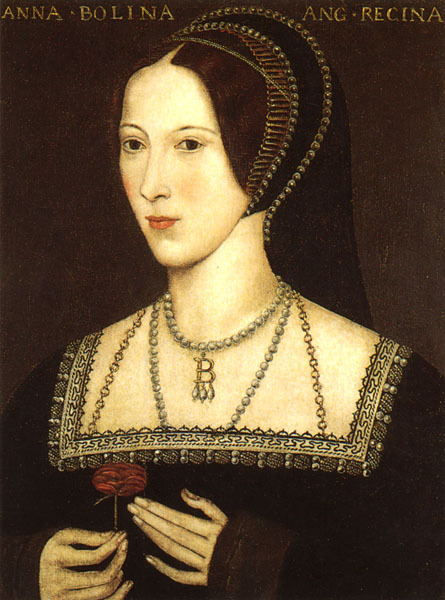 No other contemporary author described Anne Boleyn's hair colour as black. The Venetian ambassador, whose description of Anne's appearance has been viewed as largely accurate, stated that she had 'a swarthy complexion'. Simon Grynee, a professor of Greek at Basle, similarly noted that Anne was of a 'rather dark' complexion. It is possible that she had black hair, of course, but as Susan Bordo suggests, the notion that Anne Boleyn had raven tresses belongs largely to the work of Nicholas Sander, an author unquestionably hostile to the queen and her daughter, Elizabeth. 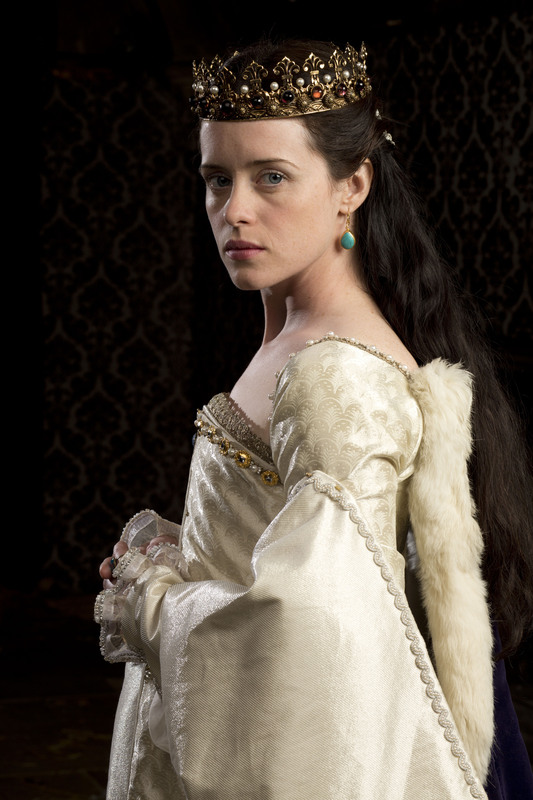 Above: Often Anne Boleyn is portrayed in modern films and TV with black hair. Natalie Dormer (left) in The Tudors and Claire Foy (right) in Wolf Hall. 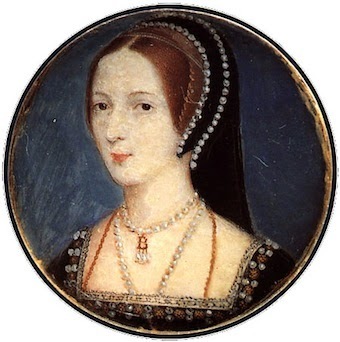 Anne Boleyn's hair was almost certainly dark. Cardinal Wolsey allegedly referred to her as 'the night crow', probably alluding to her appearance, and as we have seen, at least two other individuals described her as possessing a dark complexion. But it does not necessarily follow that her hair colour was black, and it is possible that it was the influence of Nicholas Sander's hostile description that meant that she was portrayed in portraiture as having black hair. It is important not to underestimate how influential Sanders' work was at the time. As Retha Warnicke explains, it formed the basis for every subsequent Catholic history of the Reformation, and by 1628 it had appeared in six Latin editions and was translated into six other languages. Other portraits depicted the queen's hair as lighter, whether medium brown or even reddish. It is possible that these portraits 'beautified' Anne, so to speak, giving that queens were customarily depicted in artistic mediums with fair hair, because it was associated with fertility, virginity and goodness. But it is also possible that these portraits more accurately represented the queen's true hair colour. Above: Just how dark was Anne? Two reputed portraits of her that show her with lighter hair.